I joined Standard Chartered Bank’s Global Channels Innovation Team in 2011, responsible for a brand new Mobile Banking project, and acted in multiple roles including Scrum Master, front-end architect, project manager, and also coaching the cross-site teams to scale Agile among three countries. In that project, we had not only introduced the front-end tools based on node.js and HTML5, but also the good engineering practices such as Continuous Integration, Test Automation, trunk-based development, unit testing, etc. Besides Scrum, I also introduced lean KanBan into work, tried to integrate it with Scrum. Just during at that time, I started to get involved in community to organize events and share presentations, get to know more Agile fellows. I started with wider reading, summarized my experience on my personal website (www.JackyShen.com), because I realized that knowledge can only become my own by constant summarizing and sharing to others. In the passed six years, I had been smatter to agile in the beginning, sometimes confused as well. Nevertheless, it’s important to keep continuous learning and improving, so I always insisted on the road to explore the agility in the actual development and management. Looking backward today, the honed during that time brings me large quantity of achievements and accomplishment, and also helped me formulated a complete Agile values and practices system of my own. I have an awareness during that period, that besides the hard knowledge such as the agile basic concepts, tools, framework, way of working etc, the more important is that I should be able to influence others and convenience the counterpart to not resistant to the reform. This thoughts inspired and benefited me to research deeply on soft-skills like facilitation & coaching. I have achieved my CSP certification in 2013. In the same year, I made an audacious decision to become an external agile coach, and help others with the knowledge I have learned during my agile journey. After I undertake this career, I have delivered service for many famous companies such as Cisco, Ping An Insurance, China Merchants Bank, China Mobile etc. I also successfully registered as the CSD certificate trainer in Scrum Alliance, so as to promote agile craftsmanship & engineering practice in many cities including Beijing, Shanghai, Taipei and so on. During the several years working as a fulltime agile coach, I have provided relevant training & on-site coach services for dozens of enterprises. Some enterprises concentrated on team collaboration, some on organization transition, some on engineering practice. The coaching experiences in those company have greatly expand my views. 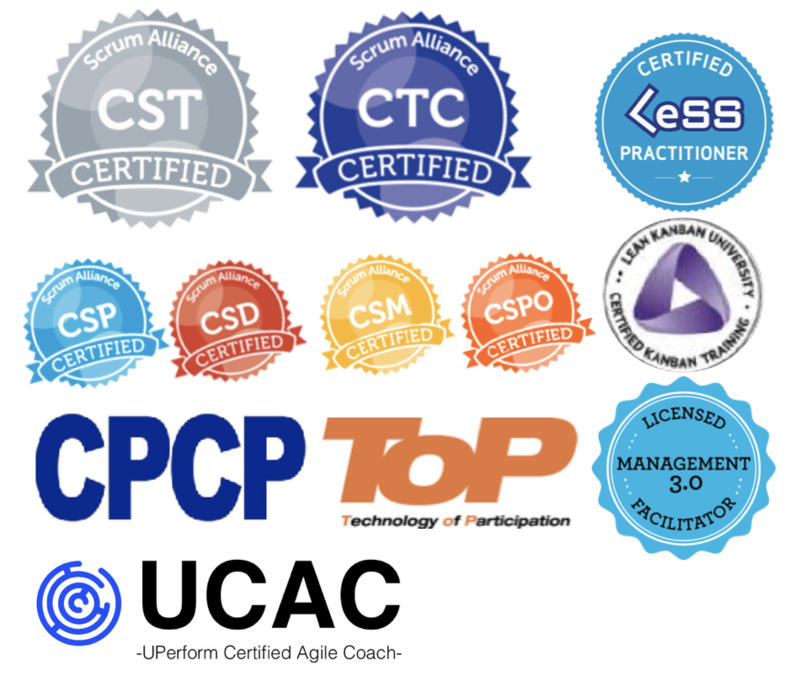 Simultaneously, I have given CSM/CSD certification courses for many times, and have attended to activities and conferences to share my experiences in agile practice. With the support by Chinese famous CST – Bill Li, I luckily got many opportunities to co-train with him. We developed new course and did presentation together, and Bill even given me many opportunities to practice my business development skills. His precious feedback and advises have accelerated my growth. I also have learned a lot from Dr. Admam Wu when I was working with him to provide consulting service, especially on how to balance desire and reality, grow up better with your clients. I have many worries and anxieties before I quit my last job, but you know that we must face the uncertainty, “Don’t Fear The Unknowns”, it will be more splendid to take risks. I have improved myself in the way of continuous iterations during those years, and it is a great time in my life. Until then, I have completed the transformation in my career: from a traditional developer to agile developer, then to agile manager, and finally full-time agile coach. I became Cerfitied Team Coach (CTC) of Scrum Alliance just before 2016 China New Year, which is the latest and most advanced guide level certification. So far only 3 people got this certification in the world, and only one from China. This applying journey drives me more clear understanding on Scrum Alliance’s thought about Agile Coaching, that is to help companies improve the performance with combined skills of consulting plus coaching, which is very close to my understanding through many years practical experiences. When I was filling the CTC application form, not only I summarized the work and achievement in my client teams, but also I concluded my learning and growth as well, which is the most precious treasure those years. An Agile Coach should work and study in an agile mindset. At present, the total number of Certified Scrum Expert is not much in China, especially the professional level and guide level. Considering the huge amount of IT enterprises and practitioners in China, promoting Agile in wider scope is still lots work and long way to go. This time I am honored to obtain the CTC certification, which not only means great encouragement to me, but also a big inspiration to overall China’s Agile atmosphere. The facilitating and coaching technology that is related to Agile coaching is also growing up progressively in China. I have the responsibility to feedback the community with my grown-up experience and understanding in agile, and helping more people better recognize the career as Agile Coach, so that they can grow faster, and also enable China Agile community get acknowledged in the world. I have consolidated my past learned knowledge and live experience into a SEU course called Deep Awareness- Advanced Agile Coach which includes four capabilities as required to be an Agile Coach (Teaching, Mentoring, Facilitating, Coaching). Now, this course has been iterated several times, in the course we’d deeply investigation and discussion to the mindset and thinking behind Agile practices and tools, and also do transboundary with Zen, Coaching and Science. That course more emphasizes on soft skills to inspire the growth of Agile Coach instead of hard skills. Hope it can contribute more to Agile community. Many thanks for the support and encourage from Bill Li and Dr. Adam Wu these years, also thanks for the sharing, support and inspiration from Lv Yi, Vernon Stinebaker, Ethan Huang, Daniel Teng, Ronald Mai, Eric Liao, Lu Ning and Wang Yu, and thanks all the inter-support from the Agile community. I remember the “Agile Tour friends gathering” in Xiamen 2014 where there was one session that everyone talks about their feelings about agile. What I said was “Agile should become part of our life”. At that time, I just thought I should do agile as an good example to others. In the same year, when I stood on the opening session on Regional Scrum Gathering Shanghai as the main producer, I said, “Agile should not only for product research & development, it should also go to other industries, even more integrated into our life.” Time to year 2015, I further awared the inner connections between agility, complex system, Zen, coaching techniques. In these years I constantly getting in touch to the areas never imagined, I finally felt I start to understand agile a bit from cross-border learning and back to agile.